My Syrian dried apricot charoset (listed as #5) has been featured with several other interesting charosets on KosherLikeMe in a post entitled,”8 Charoset Recipes Sure to Spark Chatter at your Passover Seders.” Check out this delicious article, and let me know what type of charoset you plan to make this coming holiday! During my fall trip to Roosevelt Island (see post, “Roosevelt Island: My Trip To Instanbul), I visited Jale Turcihin and she taught me how to make Amodrote, which in Izmir is (apparently) known as Frittata (sounds Ladino, no?). While it does contain cheese, in Jale’s home it was the Passover tradition to serve a variety of Amodrotes (eggplant, leek, spinach) before the main dishes came out (even if they contained meat). The combination of the Kaseri — a sheep’s milk cheese — with the yogurt gives a special tartness that to me is particularly Mediterranean (and reminds me of my own Syrian Kusa b’Jibbin (Squash Cheese Pie). In Jale’s home it was served with a small glass pitcher of a sugar syrup on the side, which when drizzled on top would give a sweet and salty taste, something one often finds in Sephardic cooking. It’s a great type of dish to learn for any meal or time of year, especially when you are looking for vegetarian options. And if the “dairy-before-meat-in-the-same-meal” custom doesn’t work for you, then save it as a dish for one of those long Passover days when you simply don’t know what else to prepare for dinner! 1. Peel the outside of each zucchini lengthwise so that you create dark green and light green ½-inch stripes, about ½ inch apart (the peeled part will be light green and the dark part will be the dark green skin, about ½ inches wide). 2. Coarsely grate each zucchini by hand or in the food processor and pour into a large colander. Lightly toss with ½ teaspoon of kosher salt with your hands, place colander in a baking pan or the sink, and drain for at least two hours in order to extract excess liquid. 3. Working one handful at a time, scoop out and squeeze the zucchini even further to discard any excess liquid before placing it into a separate mixing bowl (you should have about 6 cups of grated zucchini once liquid has been drained and squeezed). Discard all drained liquid. 4. 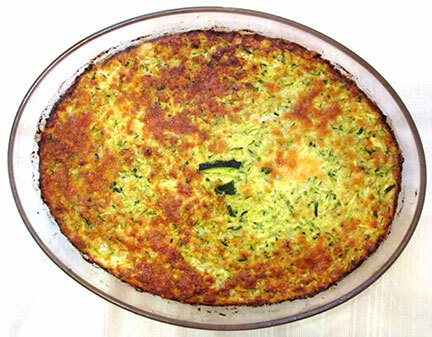 Add 2 cups of the grated cheese (reserving remaining ½ cup for top), eggs, yogurt, and ¾ cup of the matzah meal to the zucchini, and squeeze mixture together with your hands until soft and fully blended. 5. Preheat the oven to 375 degrees F.; coat just the bottom of an 8- or 9-inch x 13-inch baking pan with the 1 tablespoon of oil, then sprinkle the bottom evenly with the 2 tablespoons of matzah meal. 6. Pour the zucchini-cheese mixture into the pan and spread out evenly with a rubber spatula. Sprinkle top with the remaining ½ cup of grated cheese and place on middle rack of the pre-heated oven to bake until top become a dark brown color, about 1 hour and 15 minutes (pie should be soft but solid enough that when you gently shake pan it doesn’t appear too watery in center). 7. Remove from oven and cool about 20 to 30 minutes to set. Serve warm or at room temperature.